With more and more of our heritage hawkers getting in their ages, it is difficult for them to continue whip out the delicious food that they have been doing everyday for so many years. And being a hawker isn’t a glamorous job, compared to being a banker, lawyer, teacher or other professionals. Therefore, most of the heritage hawkers don’t any successor, and we risk losing out all the good food, which our future younger generations will not live to eat. 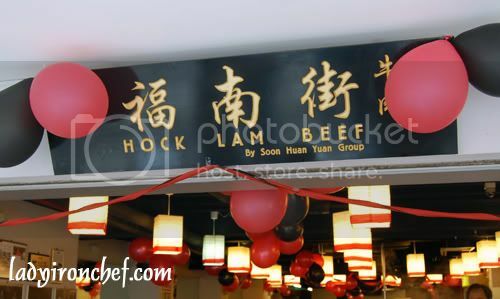 Hock Lam Beef is the golden testimonial to beef kuay teow. Having been around since 1911, it is a wonder to see it continue serving out bowls of beef kuay teow everyday rain or shine up till today, for 97 years already! We have Tina, the 4th generation owner, who gave up her professional job and rather slug it out in the kitchen, so as to ensure our beef kuay teow will still be there. 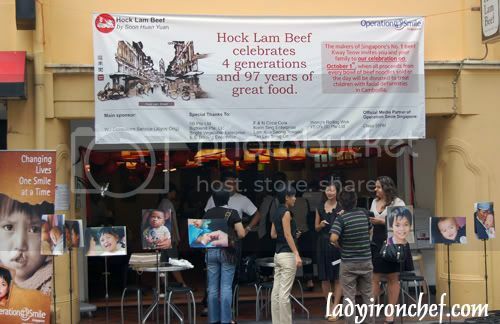 To commemorate their 97th anniversary, Hock Lam decided to donate all their sales proceed on 1st Oct to to Operation Smile which is a worldwide movement to fix cleft palates in kids. 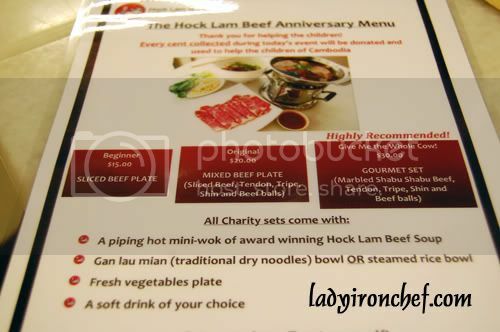 As proceeds for that day was all going to charity, Tina came up with a special menu, instead of their usual $4 a bowl beef kuay teow. There was three different selections, the beginner at $15 which had sliced beef plate. 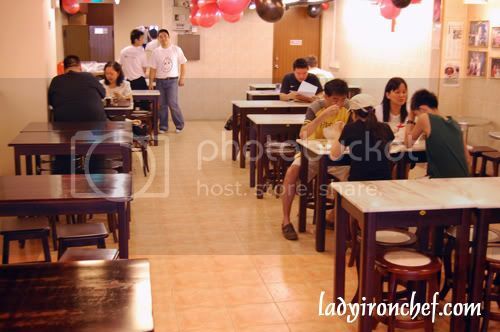 The original at $20, a mixed beef plate which included sliced beef, tendoin, tripe, shin and beef balls. And the “give me the whole cow” premium gourmet set at $30 which had the same stuff as the $20 set, with the exception of the sliced beef, and instead there was marbled shabu shabu beef. 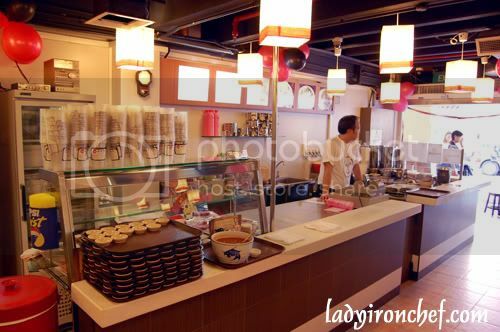 The Gau lau mian (traditional dry noodles) was nice, with their sauce used. 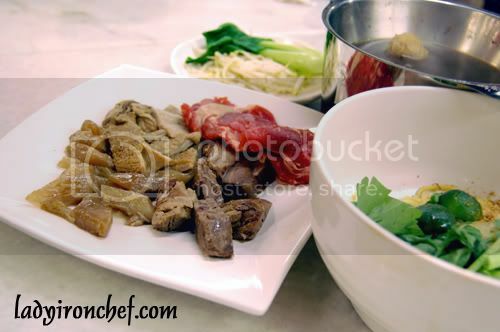 Besides having fresh beef, the other thing that makes or break a good beef kuay teow will definitely be the soup base. And Hock Lam’s one certainly was excellent. Personally i did not really like to eat beef kuay teow or noodles because from far i could detect the very strong beefy smell of the beef soup. Hock Lam soup did not have a very strong beefy smell, but that did not mean that their soup wasn’t good, rather, the soup was very intense with beef flavours, which was evident of the many hours put in to cook the soup. 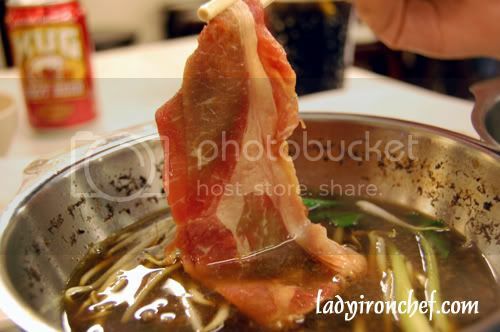 For the older generation and the traditional beef kuay teow purist, they might resist the idea of shabu shabu in a traditional shop like Hock Lam. But times are changing, and having gourmet beef at one of the best store serving Beef kuay teow, will be an interesting concept, which i believe appeals to the younger generations who will pay more for quality. 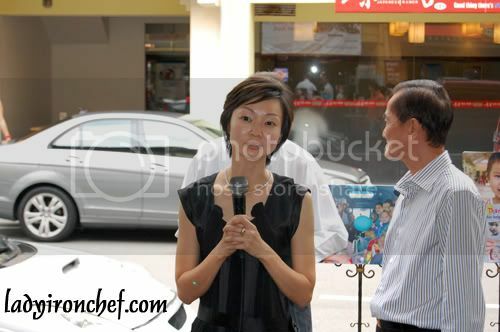 Tina and her father, for without them, there will not be any Hock Lam Beef kuay teow. 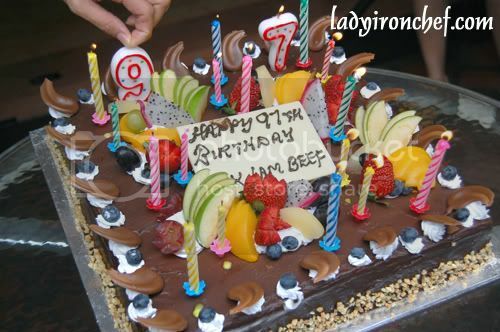 Happy 97th birthday Hock Lam Beef and many more years to come! And i will like to thank the folks at Olive consulting who invited me for the occasion, and Tina for her hospitality.